Hello music video comrades! It’s Andy Gesner and the staff from HIP Video Promo, here with an intriguing new clip from an artist heralded for his exceptional talent. 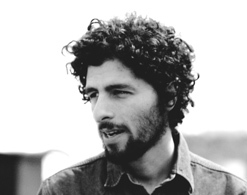 Swedish-born José González has won plaudits for the near-mystical quality of his acoustic songwriting and for the intensity of his performances. Veneer, his debut album, reached the British Top Ten, launched three singles onto the U.K. charts, and introduced the international indiepop audience to a remarkable new voice. His guitar style – a combination of folk-pop urgency and classical precision – has further endeared him to fans of unique musicianship. He’s been compared to Nick Drake, Elliott Smith, Neil Halstead, and even art-folkie Roy Harper, but the only real thing he shares with his forerunners is an unalloyed commitment to a personal musical vision. If the video for “Down The Line” is any indication, he’s also got excellent taste in alternative comics. Andreas Nilsson and Mikel Cee Karlsson’s moving clip for the new single is inspired by Manhog Behind The Face, the arresting strip from underground cartoonist Jim Woodring. (Nilsson and Karlsson also shot a follow-up video for “Killing For Love” that also uses similar imagery) Woodring’s character is a burly man with a pig’s snout, and he’s likely to follow his base urges, even to the brink of self-destruction. But he isn’t violent – on the contrary, there’s something endearing about the man-hog, and his ingenuous expressions of natural instinct. José Gonzalez’s attraction to Woodring’s work, and to Manhog Behind The Face in particular, will be unsurprising to anybody who has followed his work so far. González’s writing seeks to strip away artifice and lay bare primal emotion; it is no coincidence that his new album is titled In Our Nature. The singer-songwriter has stated in interviews that his aim was to “bring out the primitive aspects of human beings”, and indeed, the writing on In Our Nature is bold and uncompromising. His choice of covers is telling, too – here he does “Teardrop”, Massive Attack’s hallucinatory love ballad, and a song that speak directly to the unconscious. “Down The Line”, the lead single from In Our Nature, is steeped in eerie foreboding, and feels like the soundtrack to a beautiful but disturbing dream. Always a conceptual thinker, González has already announced that the clips from In Our Nature will form a series examining human folly. Nilsson and Karlsson – known stateside for their work with The Knife, one of the best-loved Scandinavian indie bands – match “Down The Line” with some breathtaking visuals and a few well-placed disturbing images. The clip opens with the man-hog on a motorcycle; he’s tearing down a wet country road, nervously looking over his shoulder. Mist falls on the verdant landscape, and a prevailing sense of peril seems to hang over the landscape. The man-hog lives in a genteel – but somewhat somber – farmhouse with cracked windows and an old globe in the study. As he spins it, shots of José González and guitar are projected on the corrugated exterior of the building. (The singer is a spectral presence; he’s not really there, but it’s his foreboding that animates the story.) Images of a wild waterfall and flames licking at the wheels of the motorbike serve to underscore the troubled mind of the man-hog. He traces a woman’s name on the inside of a car window with his finger; later, he watches impassively as he sets the vehicle ablaze. Up in smoke it goes – and spectacularly – as the man-hog rides circles around the flaming wreck, staring impassively ahead. Mark Fotiadis, Stephanie Trick and the entire Mute team have hooked us up with everything you need to give this video the maximum amount of exposure. Let us know if you’d also like to get your hands on In Our Nature for your on-air giveaway purposes. This will be one of Mute’s most exciting new release of the Fall, so this is your opportunity to get in early with an artist that is sure to break big! If you need more info, call Andy Gesner at 732-613-1779 or e-mail us at info@HIPVideoPromo.com . You can also visit www.Mute.com, or www.Jose-Gonzalez.com to find out more about Jose Gonzalez.